In my family, eating salad is an event all of its own and I have never had a meal at home that was not accompanied by a salad on the side. The idea of a salad on the side along with a meal every single night might seem odd (at least that’s how it’s been expressed to me) but I’ve never known a home cooked meal without it. Every night at dinner it goes without saying that there will be a salad – it has become an integral part of the fabric of our family meals. Without a doubt the salad champion of my family is my father. He is the one who passed this salad addiction onto me. In recent years he’s taken this habit to whole new levels, at times making my mother go to the brink of insanity. 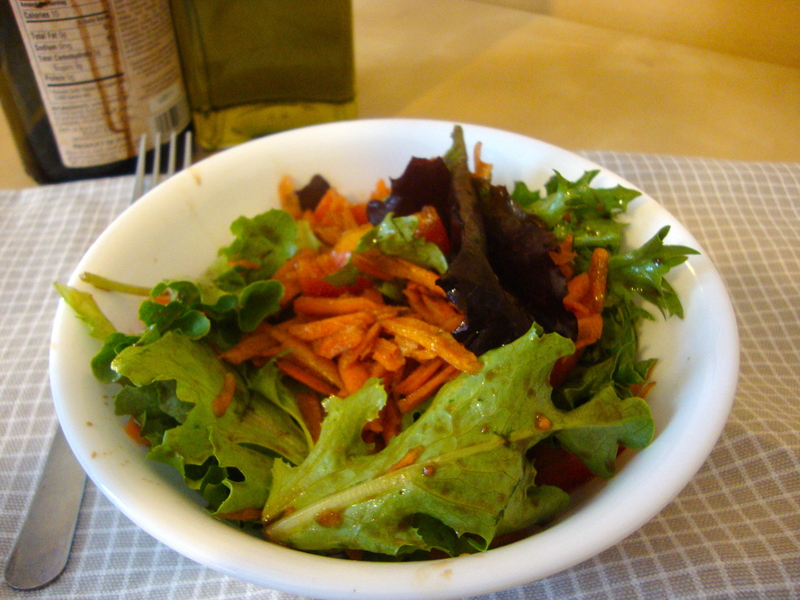 She exclaims that it cannot be possible for them to go through a $5 box of salad every three days and that he needs to learn to tone it down – of course he never does. 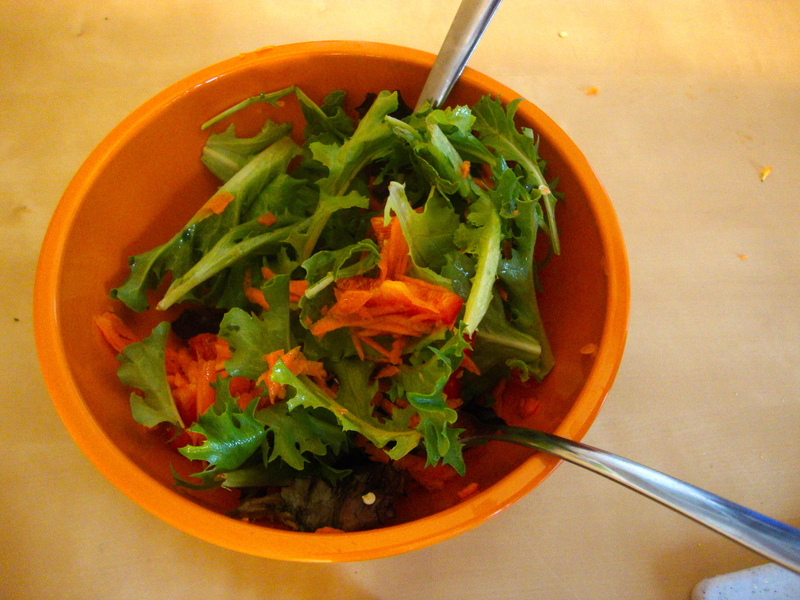 Last time I came home my parents had dinner waiting for me and there was – as expected – salad. This time my father had taken it to a new level, complete with pomegranate syrup and little surprises of fresh parsley and mint. He’s been known to make a side salad with up to 14 different vegetables at one time and then to list all the different veggies in the salad to whoever might be over for dinner. In retrospect, I feel a bit bad for all the friends that have come over to dinner at my house over the years. I always ask if they will eat salad and most say yes, even if just to be polite. I’m sure what they get is not what they’re expecting. Not only does my father create an excessive explosion of vegetables, they are dressed in only oil and vinegar, the complete opposite of the American love of heavy dressings (here’s looking at you, Blue Cheese). My father has been known to make an unbelievably huge salad for only a few people in a large bowl to the extent that my mother has in fact been trying to get him to use smaller bowls to get him to control himself. Then he will serve it to our guests and eat his portion out of the serving bowl so that he can savor all the extra balsamic vinegar that drains to the bottom and believe me, there is a lot. 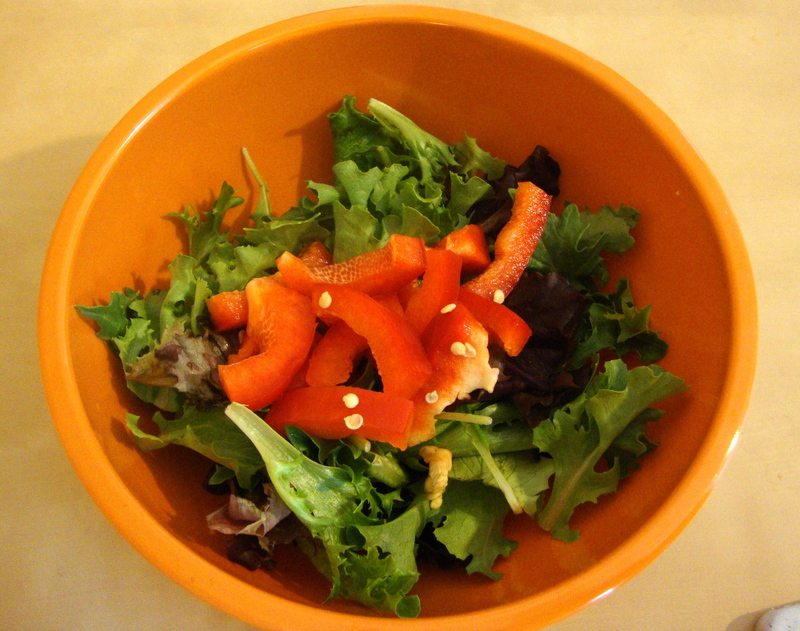 Now that I’ve moved out of the house I’ve continued the tradition, eating a small salad with dinner and always enjoying the extra vinegar at the bottom of the bowl. 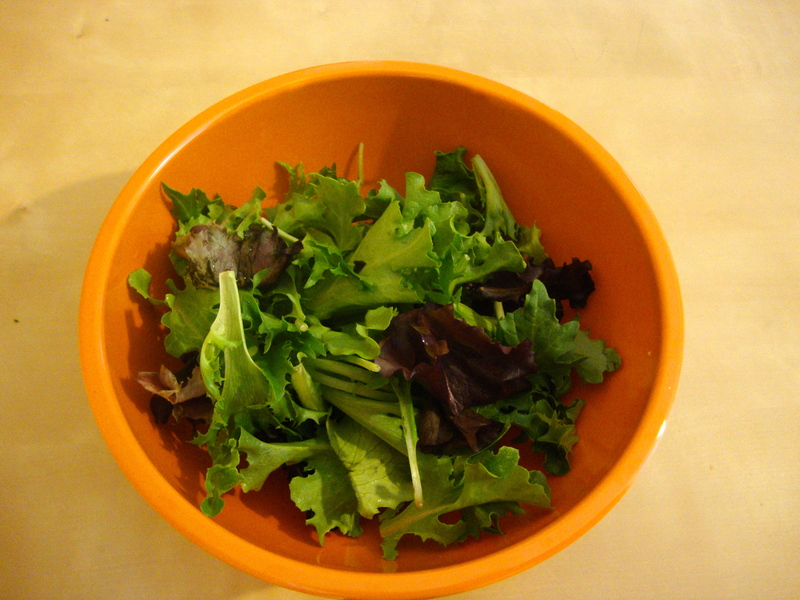 Throw your lettuce into a large salad bowl because even if you’re only three people lord knows you love your salad. 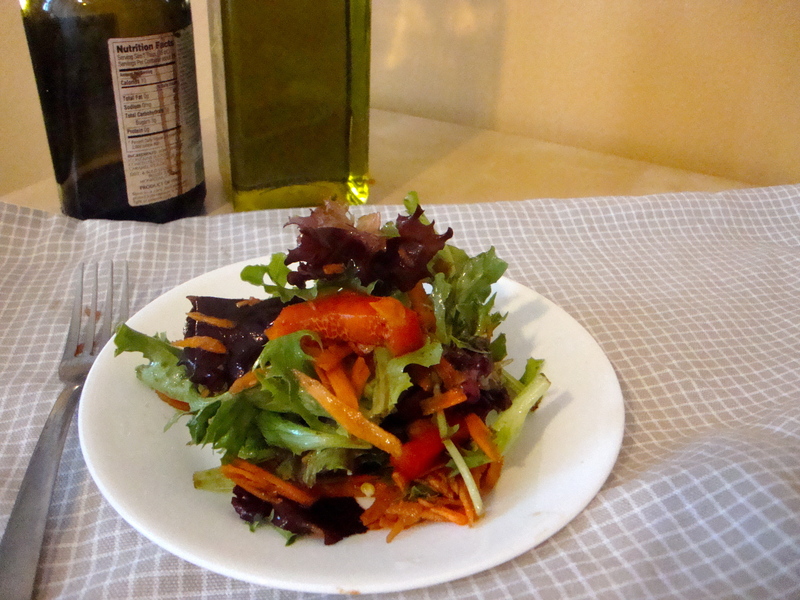 Wash your vegetables, cut them up and add them to the salad. 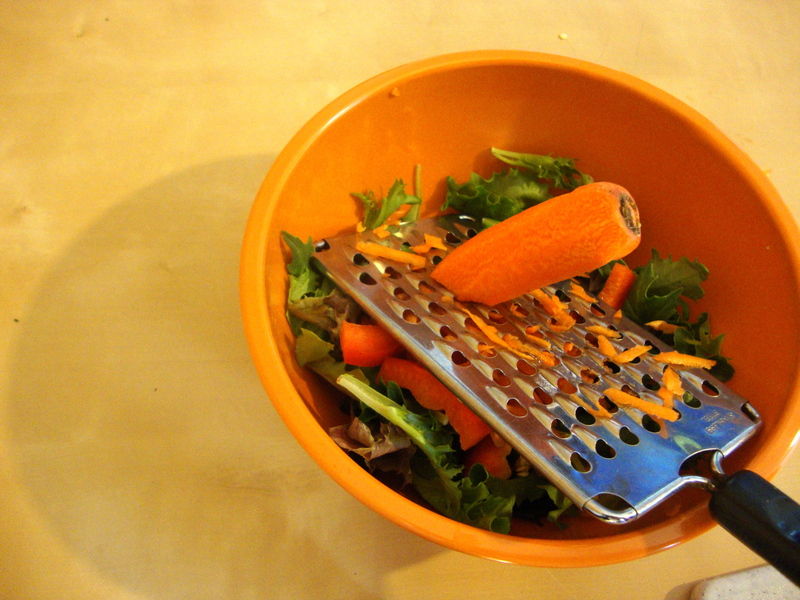 I like to grate the carrots directly into the bowl. 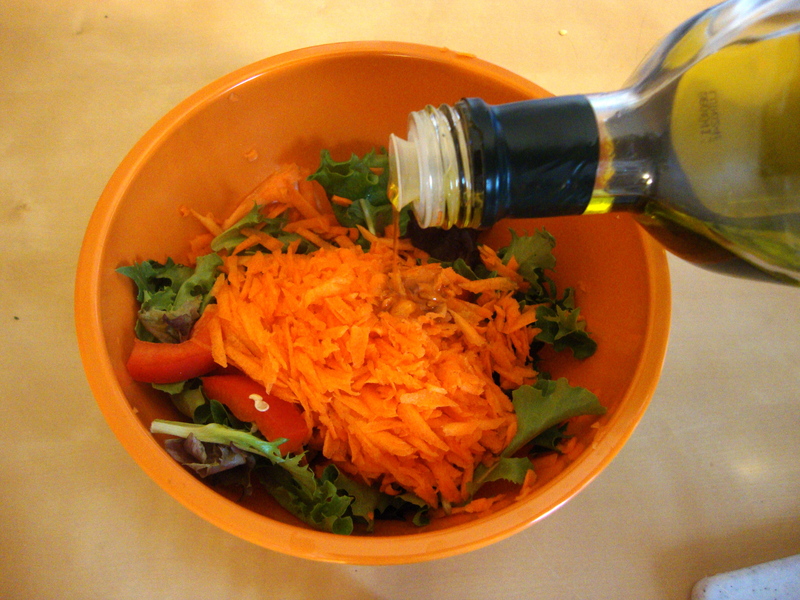 Drizzle a bit of olive oil over the salad, then toss using a fork and spoon. You want all the veggies to be lightly coated with the oil. Add a few shakes of salt and pepper. Then add a few shakes of vinegar, take it easy because you can always add more later. If you are my father you will do the opposite and decide to add more vinegar now, thinking that you can always drink it up later. Toss again and serve. If you like, garnish with a bit of pomegranate syrup. Serve with dinner. Beautiful story about your father. Sounds like a delightful tradition.